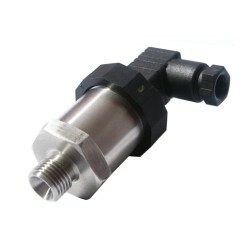 Low cost sensor for measuring small pressure ranges from 0-50 mbar (10 inH2O) to 0-1000 mbar (15 psi) of liquids or gases. Choose from a full list of outputs, electrical, connectors and accuracy specs to meet your OEM custom product integration requirements. The IMP LR pressure transducer has a silicon semiconductor strain gauge sensor element sealed inside an oil filled pressure capsule which produces a high output sensitivity which is particularly advantageous in reducing signal noise at lower pressure ranges. Unlike many low range pressure sensors which are only compatible with non corrosive gases, the wetted parts of the IMP-LR low gauge pressure transmitter are made up of all stainless steel components and elastomer seals, both of which are compatible with many types of liquids. Monitor line pressure of propane and natural gas delivered to industrial grade coffee roasters. Measure the pressure level in an industrial laundry machine. Measure the pressure of a diesel fuel pressure line between the fuel tank and engine. Measure the pressure of hot air in a pipe. Oil reservoir tank level for a small hydraulic tank. An elevated & compressed 750 – 1250 millibar absolute range for the measurement of atmospheric pressure. What is the country of origin of the IMP-LR pressure transducer? The country of origin is the United Kingdom. 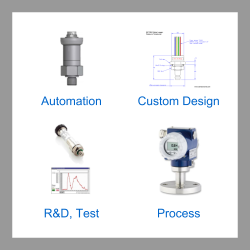 What is the response time of the IMP-LR low range pressure transmitter? Is it possible to specify a different scaling for the IMP-LR pressure transmitter with a barometric range? Yes you can select ranges from as little as 950 to 1050 mbar absolute up to 750 to 1250 mbar absolute. It is possible to provide the standard accuracy of 0.25% for any span from 100 to 500 millibar. For the higher accuracy option of 0.1% the minimum span possible is 350 mbar. Is it possible to have negative (e.g. 0 to -100 mbar g) and compound pressure ranges (e.g. -100 to +100 mbar) with the IMP-LR low range pressure sensor? We are looking for a small, low cost atmospheric pressure sensor with a range of 900 to 1100 mbar absolute or similar, with 4-20mA output signal and G1/4 process connection. The sensor will be used in cooled flue gases? It is possible to offer a custom scaled 4-20mA output for the IMP LR calibrated to a 900 to 1100 mbar absolute range. What is the lowest absolute pressure range possible with the IMP-LR? The lowest possible absolute range for the IMP-LR series is 0 to 350 mbar abs, and the accuracy is specified as 0.5% full scale. I’m looking for a sensor to measure engine vacuum in a small engine crankcase from -1 to 0 psi with a 4-20mA output? If I order the 0-5 volts output version with a 0 to -150 mbarg range, will the signal coincide with 0 mbar or the -150 mbar end of the scale? You can order order either. 0 volts at 0 mbar is the recommended configuration because you can easily tare the zero at ambient pressure. Please select the options you require for the IMPLR Low Range All Stainless Steel OEM Pressure Sensor in your application and request a quote. Send us your enquiry for IMPLR Low Range All Stainless Steel OEM Pressure Sensor to get assistance with this product type.